Local governments’ authorities of the Vilnius district municipality obtained funds from the Polish Ministry of Foreign Affairs to buy 4 minibuses for the Polish schools. “This is a symbolic moment and time when projects are successfully realized and help is provided for Polish young people”- minister Grzegorz Schetyna said at today’s ceremony of transferring means to purchase minibuses for schools in the Vilnius region. “This is a proof that Poland cares about the future of Polish youth in Lithuania and can support them in a concrete way.” – minister Schetyna emphasized during the formal transfer of money. Waldemar Tomaszewski, Member of the European Parliament and the leader of the AWP in Lithuania thanked for the financial support of the Polish youth. “We are grateful for the spiritual and moral support, which is no less important” – the MP said. Maria Rekść, the mayor of the Region, delivered thanks for the support and cooperation to representatives of the Minitry of Foreign Affairs on behalf of the authorities of Vilnius district municipality. “We hope that minibuses will enhance the competitiveness of the Polish schools and make them enjoy high renown” – stressed Ewa Ziółkowska, Deputy Board President of the Foundation “Help for Poles in the East”. Authorities of the Vilnius district municipality have received funds for purchasing 4 minibuses for the local schools. 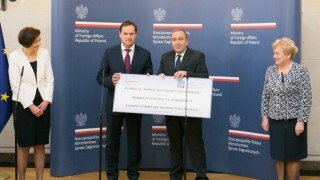 The initiative of the minister Schetyna was undertaken by the Help for Poles in the East Foundation. The funds were gained from PKO BP Foundation, Orlen Lietuva, Lotos Foundation, Energy from Heart PGE Foundation, Grupa Azoty SA, Pocztylion-Arka Powszechne Towarzystwo Emerytalne SA, and Bank Pocztowy SA. The minibuses purchased in Lithuania will serve to carry children to schools.